Wheel alignment influences the way that your car responds to steering and has a big effect on the lifespan of your tires. The wheel alignment process is quite simple but requires a wheel alignment machine. This device takes precise laser measures to locate deviation between the factory setup and the current alignment, in order to place the suspension parts back to the original alignment. The first symptom of bad wheel alignment is when you drive on a straight road and you feel that your car pulls or drifts to one side. In these cases, you will see that the steering wheel is not centered when driving straight. Over time, your tires will begin to have abnormal wearing on one side. Almost every manufacturer recommends checking the wheel alignment every six months or 10,000 km, whichever occurs first. It is advisable to perform a check every time your car hits a hole on the street causing potential suspension damage that throws the wheels out of the correct alignment. 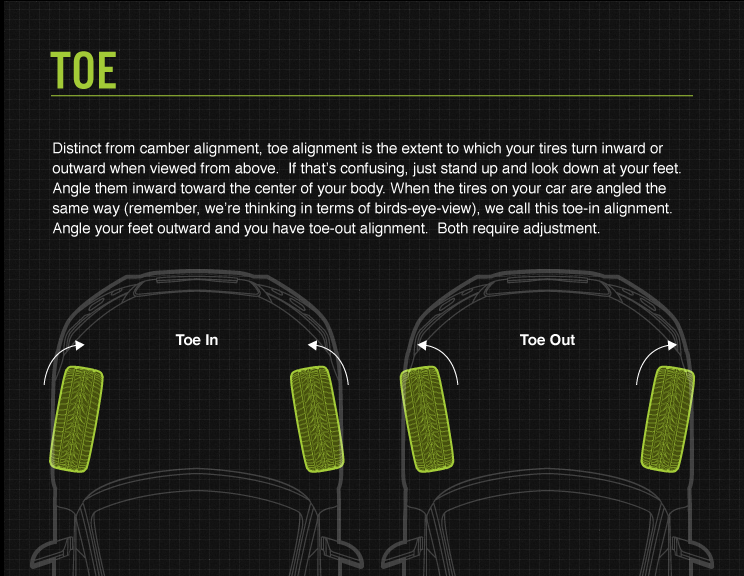 An alignment can be front-wheel or four-wheel, depending on your type of vehicle. 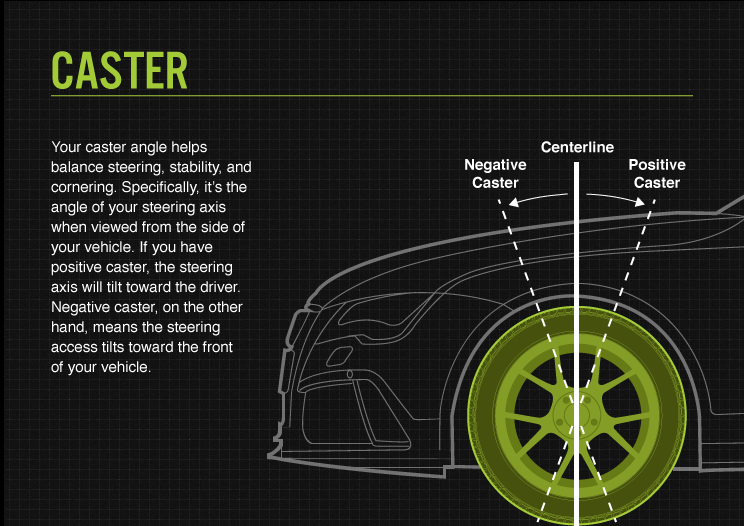 The angles we are most interested in are caster, camber, and toe. Caster is the angle in which the front suspension is positioned vertically. This can be adjusted only for front-wheel and cannot be eye-measured, instead needing laser equipment in order to correct it when needed. For many vehicles, this angle value is set as positive to increase stability and help in steering at higher speeds. This setup also assists wheels to return to center when you turn the steering wheel. A bad setup of the caster angle does not influence tire wear. The camber is the angle between the wheel and the horizontal surface of the street. 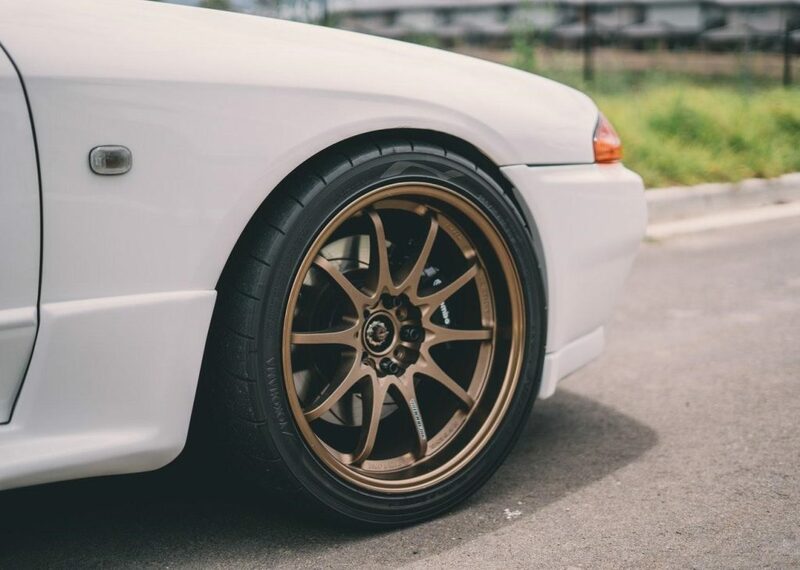 If the wheel has the top tilted towards the vehicle, this car has a negative camber value setup, and when the wheel is tilted outward the vehicle, this is a positive camber setup. 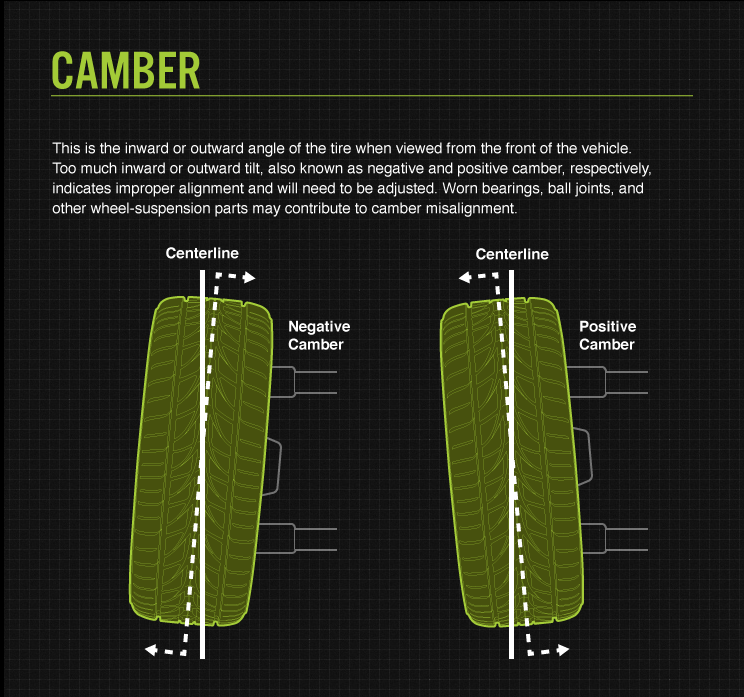 Normally, most cars have a neutral or slightly negative camber setup, in order to even the tire wear. But there are some cars with a sports setup that will have a more prominent negative camber because this value increases the handling of the vehicle at higher speeds. 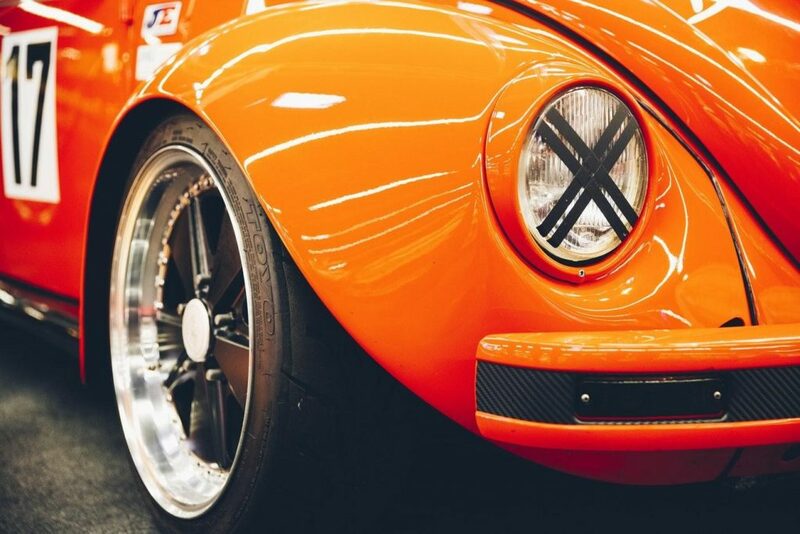 If you have a prominent negative camber, the tire will wear more on the inside, and if you have positive camber, then the tire will wear more on the outside. This angle is the most commonly needed regulation when performing a wheel alignment. The toe angle is the angle between the two wheels. It is called toe angle because is like observing the way you walk: if you walk with toes pointed inward, this is called toe-in; if you walk with perfectly parallel feet, this is a zero toe; if you point your toes outward, this is toe-out. You can set this angle on all wheels of your car, and normally will be set up as close to zero toe as possible. An incorrect toe angle will have a negative impact on your drive, making your vehicle unstable and wearing out your tires a lot faster. Even small, almost invisible misalignment can lead to abnormal wear and tear of your tires. Just for an example: with only a total misalignment of 4 mm, 2 mm for each wheel, for every mile you drive your tires will be pushed sideways for 28 feet (8.53 meters), on a 15-inch wheel car setup. Correcting this small misalignment will grant many thousands kilometers more to your tire lifespan and optimize fuel consumption thanks to reduced roll resistance. First, if you think your car is not driving normally, it is advisable to take your vehicle for a drive with a mechanic to locate the problem that can be a misalignment or a different problem with the steering or suspension. It is quite common to think that, if your vehicle pulls away from a straight line, it needs a wheel adjustment. This is not always the case. Car manufacturers factory setup the steering in order to add a little pull away from traffic, thus avoiding traffic in the case of loss of consciousness. But if this pull is too high, then yes, you may need to check the alignment with a qualified mechanic. If your steering wheel is not in neutral position when you drive straight, this is a clear indication of possible wheel misalignment, and probably a problem with the toe angle. In case of vibrations during a drive, wheel alignment is unlikely to be the cause here. This is more likely due to a broken suspension component or an issue with wheel balance. If your drive is accompanied by noises, this indicates an issue with the suspension. After repairing the suspension, you will need a new wheel alignment. You can perform many checks to your car when you suspect wheel misalignment. First, it is fundamental to check the wheel and tires, along with the steering components. Check the air pressure of your tires, since unbalanced values may lead to misalignment. And obviously, check for any damage on your wheel structure. After inspecting the wheels themselves, check the steering and suspension components before performing an alignment. Check that not a single part is damaged, because a failed component will render useless an alignment in little to no time. If anything happens to be damaged, change it right away and then perform a new alignment. Lastly, a good thing to check is the ride height. A ride height lower than normal will increase the negative camber of your wheel setup and thus increase tire wear. If you find any unusual or uneven wear on your tires, that is a possible indicator of bad wheel alignment, often the camber angle. Another common cause for uneven wear of the surface of tires is a toe-in or toe-out wheel setup. Last but not least is the phenomena known as cupping, when the tire is bouncing on the road while driving, causing uneven wear on tires. The cause of this bouncing is an exhausted shock absorber or springs, and you will need a replacement of these parts before performing a new wheel alignment. When you perform a wheel alignment, test drive your car to make sure it performs as expected. Possibly, you may need to reset the steering angle sensor to neutral, in order to reset the correct function of the stability control system. Performing periodic wheel alignment and checking over time your setup will increase your tires’ lifespan, and help you avoid greater and costlier repairs.